Northwest Houston, Spring, Klein, Cypress Creek Community—Formation, the Young Professionals committee of The Houston Northwest Chamber of Commerce, in partnership with H-E-B, Northwest Assistance Ministries and Habitat for Humanity Northwest Harris County are honoring the one-year anniversary of Hurricane Harvey with Hurricane Awareness Day on August 24, 2018. An event will be held at the H-E-B located at 20311 Champion Forest Drive, Spring, TX 77379 from 11:30-1. Speakers from NAM and Habitat will explain hurricane relief that is still available to those who suffered losses from Hurricane Harvey. In addition, the group will distribute hurricane preparedness kits as well as information about how to apply for assistance. “When we had our first steering committee meeting to re-launch Formation, the group decided that we wanted to focus on community outreach. And when we thought about honoring the one-year anniversary of Harvey, we instantly thought about all of the people in our community that still need help”, said Leslie Sloan, membership development manager for the Houston Northwest Chamber of Commerce. When Sloan reached out to H-E-B about helping host the event, there was no hesitation. “Providing aid in times of need is the cornerstone of H‑E‑B's Helping Here philosophy, which promises to stand by communities during times of crisis. For more than 100 years, the company has demonstrated its commitment to communities in crisis by donating financial support, emergency supplies, drinking water and food, as well as providing efficient ways for customers to assist those affected by a natural disaster”, said Beverly Leday, area community coordinator for H-E-B. Formation engages energetic people between the ages of 21-40 who have an interest in forming the future of the Houston Northwest area. The program offers resources that will help members not only grow in their leadership skills, but also get connected, educated, involved, and have an impact in the Cypress Creek Community. By providing events tailored for their needs and interests the Formation group will see firsthand the function and membership of the Houston Northwest Chamber of Commerce. 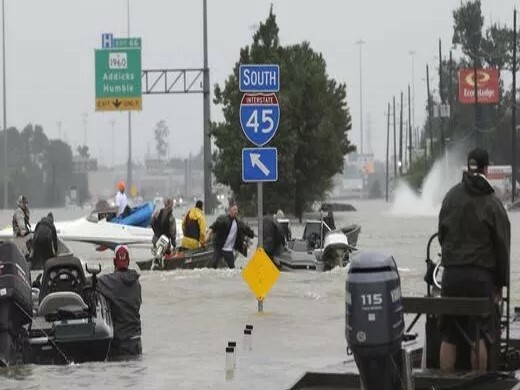 Boat traffic replaced cars in the midst of the catastrophic flooding brought by Hurricane Harvey beginning on August 25, 2017. The Houston Northwest Chamber of Commerce is a 43-year old association serving the interests of business and the community of northwest Harris County. For more information about the Chamber and about Formation, go to www.HoustonNWChamber.org. To learn more about the “Grow Northwest” Initiative, go to www.GrowHoustonNW.com.